<-- Lucky, a Peterbald from our litter, resides in NJ with Jackie. Our retired Peterbald queen, Baby, has found a loving home with Donna in Albany, NY. This Peterbald boy, Quinn, from one of our past litters resides close by with a lovely couple in NYC. Quinn's tabby sister, Qiana, moved to Boston, MA ! Retired Peterbald sire moved to a loving home in NY. A sweet Levkoy boy from one of our litters, Angel, is very much loved in his family and resides with Jessie from NYC. He has quite the sweater collection. Mogway (left) a Levkoy, and Petey (right) a Peterbald, from different litters, both were adopted by Marisa in PA. They love their life with three other sphynx brothers! As you can see, they are both handsome born models. This Peterbald stud,--> Qaleb, lives in Buffalo, NY with Matt & Stella. This Levkoy from one of our litters, Balthazar, was adopted by Westley and her family, resides in RI. Balthazar's brother, Baldwin, a mischievous Levkoy straight, resides with Kris in Queens, NY. This Levkoy beauty, Snowy, was adopted by Alice in VA. This sweet Peterbald boy, Oliver, resides in Brooklyn, NY with Samantha. Ostin, our little Peterbald heart breaker, lives in Long Island, NY with Jeff! This handsome Peterbald with championship bloodlines, Kristian, resides with John and two sisters in NJ. This little Levkoy princess, Catalina, also resides with Marisa and Mogway in PA. Mogway is one of our kittens from a few litters ago. Our sweet Levkoy boy, Coconut moved to Denver, CO with Maria and her family. This adorable Ukrainian Levkoy fold, Agatha, moved to Minneapolis with Johnny! Our sweet levkoys, Aleesa (straight) and Cayden (fold) moved to upstate NY with Jason and his lovely family. This beautiful Peterbald, Anastasia, moved to L.A. with Meg and Nick. She has two lovely Devon Rex sisters to keep her entertained. Katya, a Levkoy fold, moved into her new home in Brooklyn NY with Mollie. She makes daily appearences on her instagram page wrinklesandpurrs with her Canadian brother. Greer, a Levkoy straight, is moving to CT with Johnney and his family! Greta moved to PA with Marissa. She is a chocolate Levkoy Straight. This little Petebald rascal found a home with Olga in Brooklyn, NY. Ashy boy, a Levkoy straight, resides in Brooklyn with his sister Astra and their new mommy Alexis. This is Astra! She's so excited to have been adopted into the same home as her brother Ash! This little bobble head, Annabel, a Levkoy, was adopted by Toni from NY. She's such a little sweetheart. Alf, such a little Peterbald heart breaker. He was adopted by lovely Hazel & family, and is on a mission to break some hearts in VA! This little Ukrainian Levkoy angel, Annie, resides in Boston, MA with Dominick & family. These beautiful Levkoy Straight girls, Amalie and Angelina, moved in with Adrian and his family. They are inseparable. Our lovely Akira, Peterbald, moved in with John and her cousin Kristian, from a previous litter, to NJ! Basil, Peterbald, resides with Rafaella in San Diego, CA. 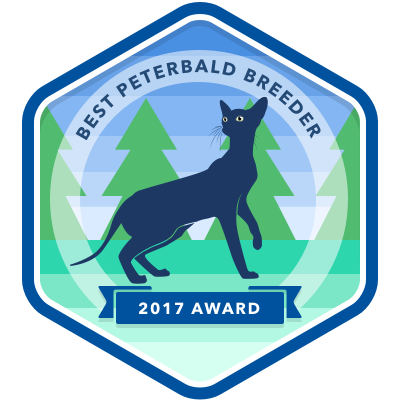 Amber, Peterbald, resides with Betsy in CA. Baron, Peterbald, resides with Karen in NYC, NY. Bogart, Peterbald, resides with Inessa and Igor in NYC, NY. Buddy, Peterbald, resides with Ryan in Mellick, NY. Benson, Peterbald, resides with Alexis in NYC, NY.